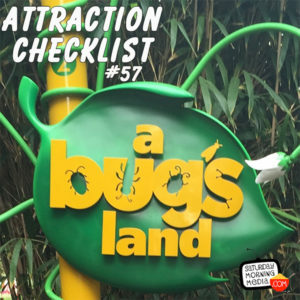 http://www.attractionchecklist.com – This episode, we say goodbye to A Bug’s Land by riding Tuck & Roll’s Drive ‘Em Buggies, Francis’ Ladybug Boogie, Flick’s Fliers and Heimlich’s Chew Chew Train. Joining me today to ride and review is Suzie and our pal John B. deHaasjoins me for a Heimlich’s Chew Chew Train Review. Recorded on August 18, 2018. On today’s supersized episode, we bid goodbye to A Bug’s Land at Disney California Adventure by experiencing 4 of the area’s attractions, Tuck & Roll’s Drive ‘em Buggies, Francis’ Ladybug Boogie, Flick’s Fliers and, of course, Heimlich’s Chew Chew Train. This area is described on the Disneyland website in the following manner: “See the world from a bug’s perspective in this playful land full of insect-sized surprises based on the Disney·Pixar film, a bug’s life!” Only Tuck and Roll’s Drive ‘em Buggies has a height requirement of 36” the rest have no height restrictions. Before we take a final ride on all these attractions, here are five fast facts about A Bug’s Land. 1. The area’s anchor attraction, It’s Tough To Be a Bug was a Disney California Adventure opening day attraction, but the rest of the rides opened in an area known as Flick’s Fun Fair in the newly names area A Bug’s Land on October 7, 2002. 2. The storyline behind A Bugs Land is the bugs built the A Bugs Land attractions when they saw Disney California Adventure being built next to them. The imagineers discovered the bug theme attractions while building The Twilight Zone Tower of Terror and then opened the land to all. 3. Several of the voice actors from A Bug’s Life provided their voices for attractions in A Bug’s Land including Dave Foley as Flick and Joe Ranft as Heimlich. 4. On March 20, 2018, Disney announced that A Bug’s Land would close to make way for a new Marvel Themed Land opening in 2020. The rides featured on today’s episode closed on September 5, 2018. 5. While not totally confirmed, so therefore not really a fact, it is assumed that Flick’s Fliers will be moved over to Pixar Pier when A Bug;s Land closes. The attraction will be retimed to the Disney Pixar movie Inside Out for an attraction called the Emotional Whirlwind. Now it’s time to bid farewell to A Bug’s Land with a ride of four of it’s different attractions. Along for the adventure today is Suzie, but John B. deHaas also took one last ride on Heimlich’s Chew Chew Train so that attraction will feature two reviews! These are binaural recordings so put on your headphones as we head to Disney California Adventure to say goodbye to A Bug’s Land.